Recommended use time for a treadmill: "Preventing is the best cure"
Recently, on some treadmills the maximum continuous use time and the minimum time needed to cool down the internal components of the treadmill are shown on the label. 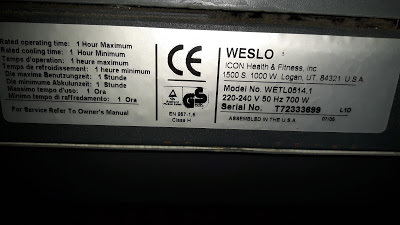 See, for example, the label of this Weslo treadmill indicates an hour of use and a pause time. A much more precise and simple / economical solution to avoid damage to the treadmill is to use a thermometer. Just place the sensor on the motor, fix it with a clamp, and you can attach the small display to the treadmill uprights so that you can check the temperature at any time. When this approaches 50 °C it is necessary to stop training to cool down the motor. In fact, most engines start a degradation process when the internal temperature exceeds 100/120 °C. In fact, they start to dissolve parts of isolation, and if you repeat this situation many times or continue for a long time you may damage your motor very seriously. Considering that the outside temperature is about half of the inside, it is understandable that under such conditions (ext. 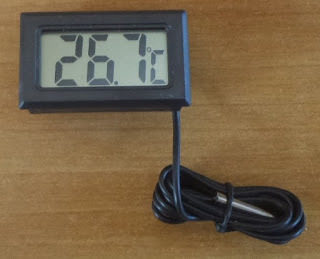 temperature over 45°C) the motor may be damaged. You will notice that when the training was interrupted, the motor temperature could rise for a few minutes instead of going down. 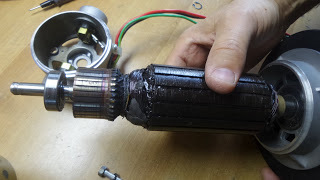 This is a natural effect because heat slowly passes from the internal parts of the motor to the outer parts, thus increasing the temperature on the outer surface. In practice, with a few euro investment you can avoid having to replace the motor.